Camphill Market has now been running for over 20 years, offering a monthly market to our valued supporters. A safe country environment, delicious organic produce, scrumptious dairy, outstanding bakery, herbs & herbal cosmetics products, along with a nice selection of regular natural food, clothing, book and jewelry vendors. Over the years many more great markets have popped up in the greater Cape Town area, opportunities for people to get their fresh groceries, snacks and interesting products and lessening the need for people to travel out. Some of our products have often been found at these markets. 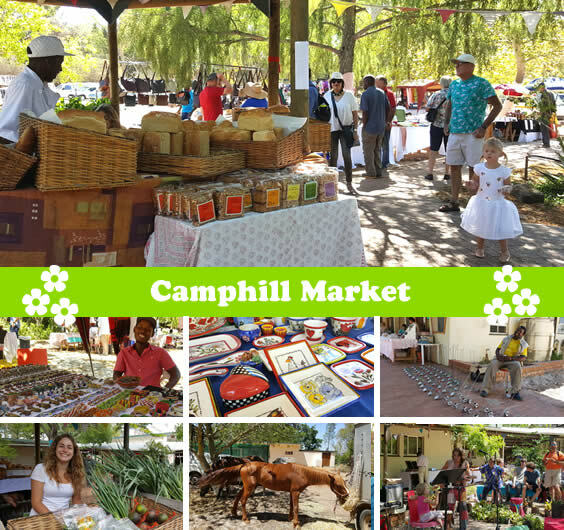 Our regular monthly markets offer entertainment, live performances, great food stalls, a coffee shop, tractor rides and an opportunity to step inside our workshops and enterprises, but all this is still just a glimpse of the Camphill experience. It’s not easy to convey the whole 53 year of existence as a sustainable village and organization in just a couple hours. So the Camphill Market Team has decided to open up more of Camphill and Camphill life to our visiting public on our market days. Over the next few months we’ll be putting into place demonstrations from each of our enterprises, which include, dairy, bakery, cosmetics, and herb garden. We will also open our concert grounds as a picnic area, offer Fynbos tours, a cycle route, walks, and interesting demonstrations / info sessions on things like organic growing, sustainable energy and other farm related topics. Watch this space for more! In the meantime, see you at Camphill this Sunday 2nd April, and on the first Sunday of every month. 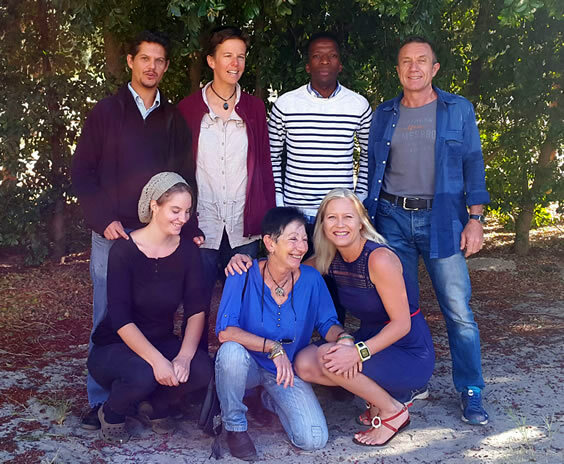 Meet the Marketing Team - this is the creative team that puts the Camphill Village Newsletter together each month. Sharing a vision and common goals in an organisation as diverse as ours is always a huge challenge. This is something that needs to be revisited regularly to get everyone to pull in the same direction. This we did three weeks ago and were very fortunate to have Herlecia Stevens of Pisa Consulting to guide us through the process. While anyone watching may have thought we were just having fun and games - playing with balls, leading each other around blindfolded amidst much laughter, we had a very productive workshop. In two days we had, together, established a new vision, mission, value set and goals for the next three years, and all committed to them. Our big job that now lies ahead, is to turn these goals into reality! 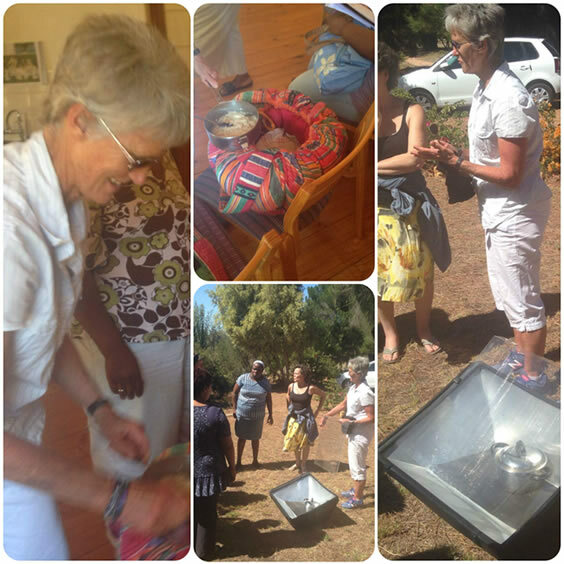 On Tues 14th Feb we were introduced to Sue Bellinger, Sustainability Consultant, who came to demonstrate the solar cooker to the Group Home Leaders of Camphill Village West Coast. She showed us how quickly one can boil water with sun energy. The solar cooker is a simple but wonderfully practical patent: A black “oven” with a shiny inside, a plastic lid that slides in, once the black pot is put inside. The sun rays are reflected from the shiny inner walls onto the black pot. The solar cooker has to be turned to face the sun directly. So, as the sun moves, one just has to turn the cooker towards it. Camphill Village West Coast will definitely benefit from the solar cooker to prepare food as well as to save on expensive electricity. Recently, our main garden 4 inch water supply pipe line burst at a T-junction. Replacement arrangements are underway. BUT, this meant our garden irrigation water was cut off. After a couple of weeks of watching our garden’s retreat, some pirate taps appeared on household pipes to service some of the gardens. About this time Cape Town instituted severe water restrictions. 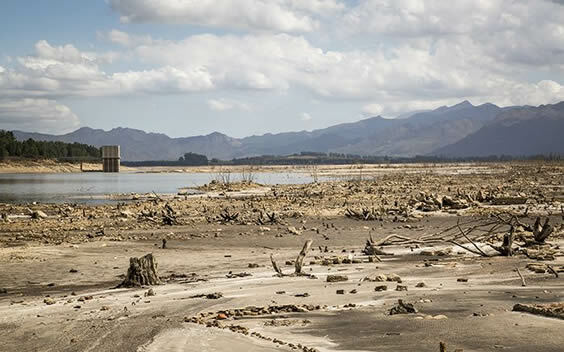 Dams feeding Cape Town with water are at critically low levels. Our borehole’s water levels are rapidly dropping. We took the decision to say No to all house garden irrigation. However we could use grey water from dish rinsing, shower water collection and vegetable cleaning to water some precious trees and herbs. All houses have placed heavy objects in the toilet cisterns to save on litres of flushing. Only running fully loaded washing machines is another new habit we are practising. 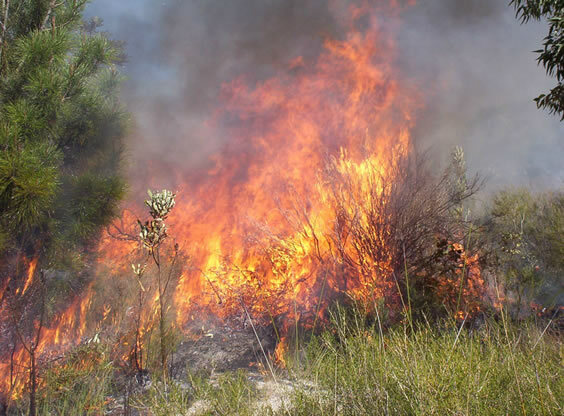 Fire and water have been the two themes that have been on the forefront of the Western Cape this summer. Over 18 000 fires have been battled in the Western Cape this summer, while we have experienced our worst drought in 100 years. As a rural, dry-land farming community we have been very exposed to both threats. 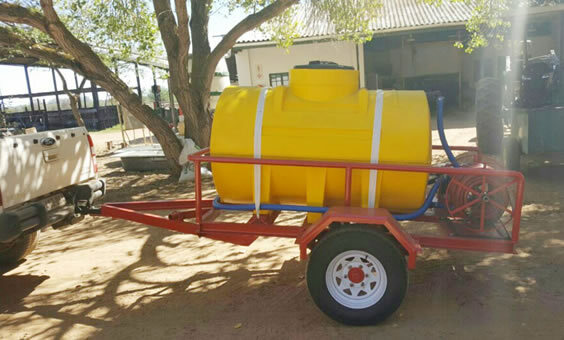 Water security is a very real issue for us, and we are very grateful to the AoCC who donated a water tanker to us as a bush fire precaution. Maintaining an optimal level of wellness is absolutely crucial to living a higher quality life. Wellness matters. Wellness matters because everything we do and every emotion we feel relates to our well-being. In turn, our well-being directly affects our actions and emotions. It’s an ongoing circle. Therefore, it is important for everyone to achieve optimal wellness, in order to subdue stress, reduce the risk of illness and ensure positive interactions. There are eight Dimensions of Wellness. In attempting to create and maintain a holistic approach to them in Camphill, we've decided to focus on the Physical Dimension and introduce a sports event as part of our weekly program at Camphill. All residents and staff join in and we have sporting or gaming fun together as a village. This creates opportunities for fun, relaxation, socialisation and a safe inclusive playing ground out of our norm and comfort zones of the daily routine. Physical exercise is good for mind, body and spirit. Furthermore, team sports are good for learning accountability, dedication, and leadership, among many other traits. Putting it all together by playing a sport is a winning combination. Exercising is a natural way to loosen up and let go of stress. Also, you will most likely make many new friends on the team who can be there for you as a support system. The whole village came together on a Wednesday afternoon and had the freedom to choose the activity they wished to participate in. 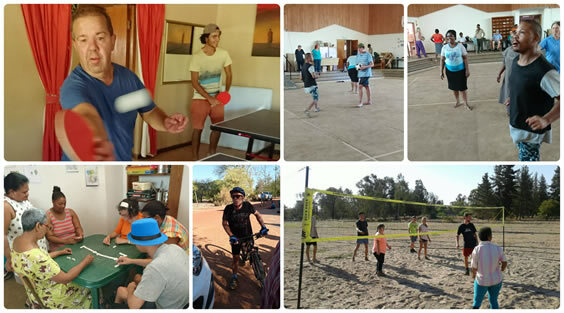 Table tennis, volley ball, soccer, cycling, running and walking routes, as well as board games for residents unable to mobilise comfortably, were set up. Everyone joined in on foot, cycle, wheelchair or chair, either participating or actively cheering on their friends. It created a fantastically lively atmosphere throughout the village, with much laughter, fun, enjoyment, cheer, and a definite escape from daily stressors for all. The feedback from staff and residents was very positive and we hope to continue with this routine, or even increase it to twice a week! I enjoyed watching people dancing and the music was nice. I enjoyed it so much I didn’t want to go home. Two thumbs ups, the bands and everything was very nice, it was a lovely get together. It was nice, I liked the songs and the food. I enjoyed it a lot, met lots of people, danced, drank cooldrinks and ate chips. I liked the music, my family came to visit and I really enjoyed being with them. So palm oil is the new buzz word on everybody’s lips at the moment. Green Peace as well as journalists from around the world are waving huge red flags and everyone from the EU down to consumers are paying attention. So what is all the fuss about? There is an international call to boycott all palm oil products. Why? 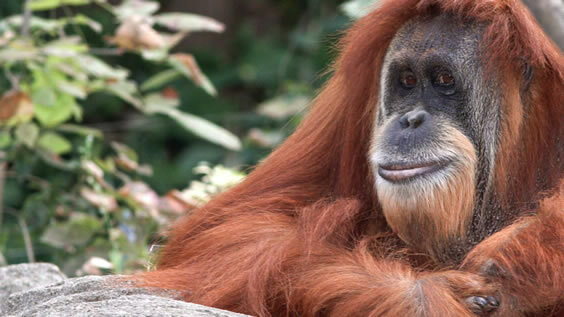 Deforestation, loss of animal life, habitats threatened, carbon dioxide emissions and the potential extinction of the orangutan… Palm oil is in a staggering amount of food and cosmetics products, It is widely used in animal feed and biofuel. It’s in chocolate, biscuits, cakes, pastry, bread, crackers, donuts, crisps, pre-battered fish and chicken, pizza, ice cream, cereal, peanut butter, and margarine., lipstick, toothpaste, soap, most candy, and even in almost every soy milk currently on the market. Look closely and you will find that a large percentage of the consumer goods at your local supermarket contains palm oil or vegetable fat. However there are many voices on the other side of the coin as well. Other wildlife and forest protection agencies, journalists and even the UN are assuring us that boycotting palm oil is not the solution. Despite the massive expansion in Indonesia, there have been good sustainable palm oil plantations running from as early as 2008 and most palm growers are small individual farmers. Banning or boycotting palm oil would mainly affect individuals and families below the poverty line. We would be hard pressed to find a sustainable replacement that would not have the same effects or significantly raise costs. A solution: that people support the existing sustainable palm plantations, stricter regulation and certification for palm plantation and protected areas. It appears that this debate is just beginning and the solution is still far away. In the interim, Camphill Village West Coast will do its bit to help slow the demand. We will soon be releasing our very own palm free soap. Keep an eye out for more info. April is Autism awareness month, and here is a bit of information about one of the fastest growing conditions in the world. Autism Spectrum Disorders (ASD) are a complex set of neurological disorders that severely impair social, communicative and cognitive functions. 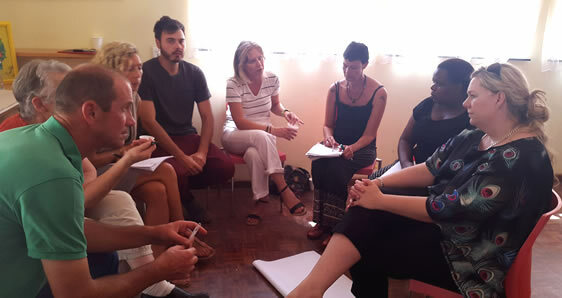 Though a thorough understanding of the science behind and treatment methodologies for autism is difficult, the basic understanding of these concepts is paramount to spreading awareness of ASD. 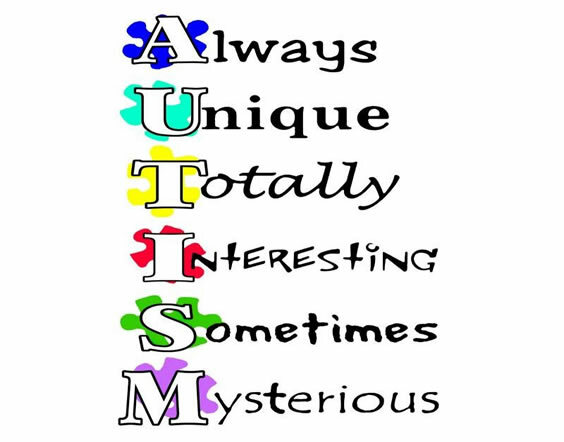 Here are some quick facts to highlight important information about autism. In 2014, the Centers for Disease Control and Prevention’s Autism and Developmental Disabilities Monitoring Network determined that approximately 1 in 68 children (1 in 42 for boys, and 1 in 189 for girls) is diagnosed with an autism spectrum disorder in the United States. No one is sure what causes autism. To help make Camphill more self sufficient and sustainable, the young co workers wanted to provide the village with its own free range eggs from chickens that we would purchase and take care of. Together with help from garden manager JP, Rudi, and Ninja, we started to think about how we could make this chicken project happen. After visiting the Spier free range chicken farm in Stellenbosch and doing some more calculations and plans, the idea was to build a chicken trailer! This trailer is going to be a sleeping, laying, feeding and drinking place for them. They can graze in the field in which the trailer stands, then after a couple of days the trailer can be removed to another field in which fresh grazing is waiting for them. 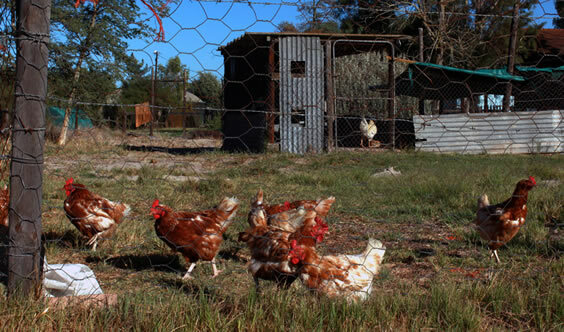 We started with our first 40 chickens plus rooster next to Huis-Ten-Bos. There they have large grazing and laying opportunities. We use kitchen compost from the houses as well to feed them. Those eggs are sold at our shop to the houses, and to the public on market days. Right now we are staying in contact with the Camphill in Hermanus who is willing to sponsor us with their unused chicken trailer. We would like to invite you to join us on the 9th of April at 5:30pm to enjoy a fairytale performed by our residents for Palm Sunday. It is the story of the “ringing stones”. It leads you through pain and evil to a light filled future. You are very welcome to join us at the hall. Imagine our surprise when we heard that we had won 25 x 30-second advertising slots on Magic 828 radio, plus the free production of our advert. We immediately gathered the marketing team and came up with a beautiful 30 second ad. It was not easy, as 30 seconds seems much longer until you have so much to say about this wonderful organisation, the special people who live and work here and all about our fantastic products we produce, our monthly market, our annual music festival and all our cultural activities. Our next question was - who will be our voice? We unanimously decided to ask Marguerita Freeks, with her vibrant personality and magical voice. She immediately agreed and the recording was done the following day. Marguerita is a wonderful friend of Camphill, and has performed at our Music festivals with The Bootleggers. Thank you to Magic Mike at 828 radio and Magic Marguerita; this is such a blessing and a gift. Copyright © 2017 Camphill Village West Coast, All rights reserved.